Note: DVDFab is third-party software that requires the purchase of a license (sold separately). It is not a QTS app and must be run within Linux Station or a virtual machine. 2. M.2 SSD operations can easily generate excessive heat. It is recommended to install a heatsink (from QNAPor a third-party provider) on the M.2 SSD. 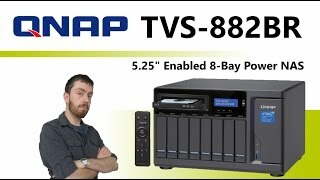 Read more about Qnap TVS-882BR-i7-32G auto tiering. If you buy this Qnap Desktop NAS and hard drives we do free build and test for the unit and hard drives. So you can use this device straight out of the box. All free of charge in TVS-882BR-i7-32G price.